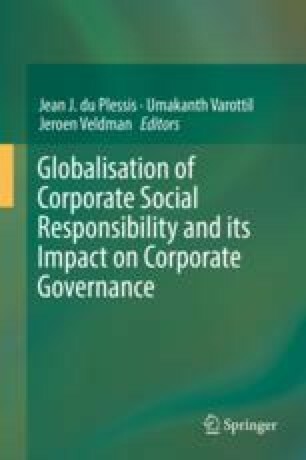 Corporate social responsibility (CSR), as a major contemporary focus for companies, governments, NGOs and communities, has been discussed from a multi-disciplinary perspective, including the disciplines of philosophy, business management, law, politics, sociology and economics, as well as pragmatically by businessmen and politically by public representatives. The term, introduced and defined to achieve a combination of economic, social, environmental and philanthropic goals, has increasingly become a mainstream business activity and has been taken seriously by government, corporations and boards of directors. It is a term that organises and accommodates corporations’ focus beyond profit maximisation towards participation in activities that improve various stakeholders’ welfare, and is typically regarded as a voluntary mechanism or self-regulatory system to achieve sustainable corporate goals. It has been suggested that CSR goes beyond government regulation, which sets minimum standards, and philanthropy, which lacks mechanisms for long-term sustainability. Laws and policies have been increasingly reinforced by market indices that recognise and measure company performance according to social and environmental criteria. I am greatly indebted to Prof Andrew Keay, Dr Jeroen Veldman, Dr Umakanth Varottil, and Dr Suren Gomtsyan for providing me with valuable comments on the draft of this chapter. I would also like to thank Prof Jean Du Plessis for his encouragement and support. The chapter was presented 2016 at the ICGL Forum held on 14–15 December 2016 in Beijing and the author thanks Prof Junhai Liu, Prof Cindy A. Schipani, Prof Gill North, Dr Alexander Scheuch and Prof Patrick Leyens for their comments.